I was listening to a local public radio show about Thanksgiving, and folks were invited to phone in and chat about Thanksgiving memories. One caller told the host that Thanksgiving was introduced by the pilgrims. And then she repeated the statement. Again and again. The host didn’t correct her. By claiming Indians were heathen, uncivilized, and lacked government and religion, colonists could spin the myth that natives were undeserving of their lands. 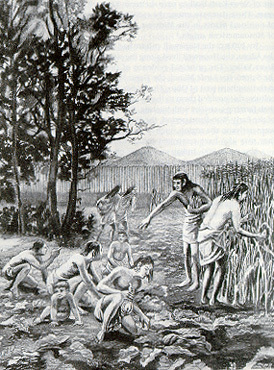 Jennings noted that, early on, a symbiotic relationship existed between colonists and Indians, who cultivated the lands, raised crops and animals, and shared their knowledge and produce with the settlers. The official instructions of the Virginia Company were to maintain peace, and they considered the Indians vital to their survival. From this context settlers adopted the practice of giving thanks at harvest time. But Indians didn’t practice Thanksgiving once during the year. Native people acknowledge their symbiotic relations with nature year-round. We acknowledge our dependence on plants, animals, rocks, mountain, trees and rivers. We thank the deer when he gives his life so our people might eat. We thank the tree for her apples in autumn. And in my family, we honor guests who join us at the table to eat, no matter when or where. We have a responsibility for treating guests as family. That’s how my family practices Thanksgiving. This entry was posted in authenticity, framing, Indian, Osage. Bookmark the permalink.